Say what? Soska? What’s that? It’s the Hungarian word for Sorrel. Pronounced ‘shoshka’. This leafy green is also called szczaw in Polish, pronounced ‘shrtav’. 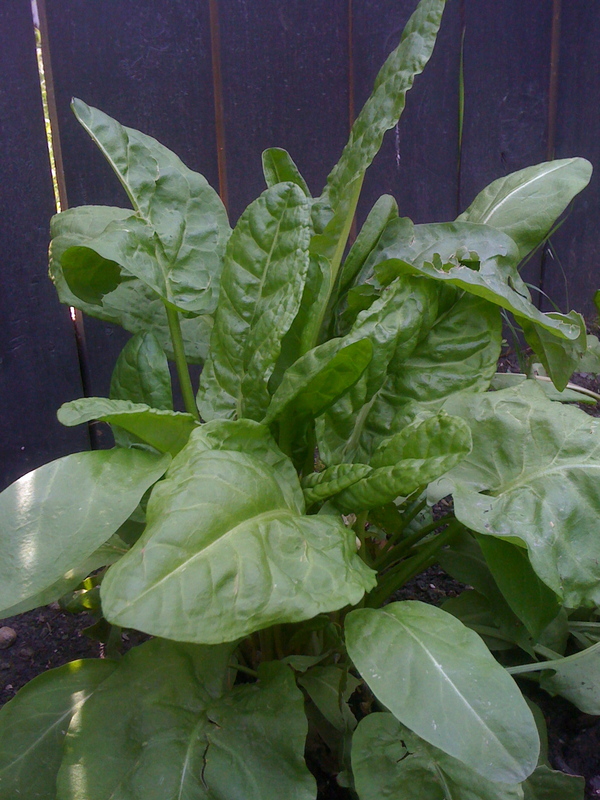 It’s also called Spinach Dock and Sour Dock. I grew up calling it soska. It is a perennial so it comes back each spring and like rhubarb, it is a staple in a European garden. Another favourite soup of mine, Soska Soup, reminds me of summer, even late spring. It’s Saturday, my plans changed and I haven’t spent much time in the kitchen since starting my new contract. What to do? Make soup from the fresh ingredients in our garden. I called mom, at the same time as doing paper work she rattles off the recipe and decides to make her own pot of soup. like. Cook it down, about 15 min. Add sour creme and warm it through. The soska releases water so if it is too thin, dissolve a tablespoon of flour or kuzu in a small amount of warm water and then add it to the soup. If the soup is too thick you can thin it by adding the other 1/2 cup of water and then some creme or more water. I ended up using 1 cup extra of water (total 5 cups) and it was perfect. I added it with the soska all at once because the water was quite low after cooking the potatoes. When I added the sour creme it was the perfect consistency. Serve with fresh cracked pepper and whole grain toast or a sour dough bun. How is your first Saturday of August? Thanks for sharing this! I love hearing about the same recipe passed down through the generations and the differences between families. I have some soska left to pick this year and i’ll give this a try.